Regular, open communication and consultation is highly valued at St Mary’s Primary School. The Parent’s Forum aims to represent the views of all parents and to be a voice to inform our school of the needs of children and families. It facilitates communication between parents, carers, staff and governors. Ensuring a diverse forum membership and representation of views from parents and carers. We aims to have two representatives from each year group. The forum is not in place to address specific concerns about an individual child or issues relating to individual members of staff. Parents who need to discuss these issues should approach their class teacher or the Head teacher. What are the objectives of the Parent’s Forum? 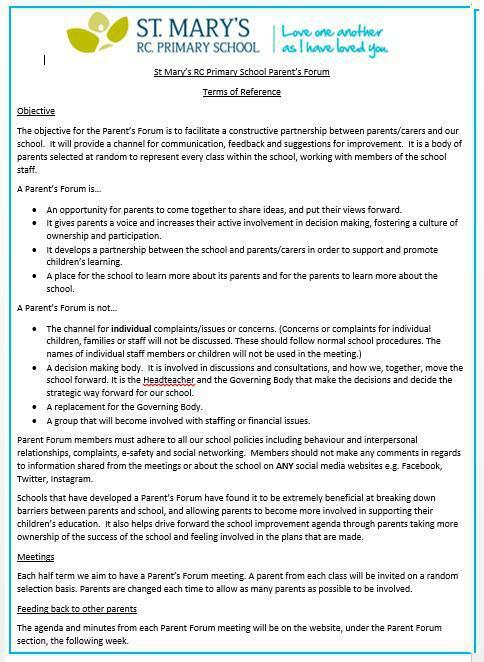 The objectives of the Parent’s Forum is to facilitate positive and effective two way communication between parents, carers and the school, providing a channel for communication, feedback and suggestions for improvements. Promote partnership between staff, pupils, parents and carers. Develop and promote ideas which support the education and welfare of the pupils and parents. Identify and represent the view of the parents on matters affecting the education and welfare of the pupils. Meetings will be held half termly and you will be invited to the meeting by invitation only. We aim to have two representatives per year group and ideally one from each class. Miss Quinn and Mrs Collins will chair the meetings and members of the Senior Leadership Team and Governing Body may attend. Parents will have the opportunity to include items to the agenda. If you have an item to be discussed and have not been invited to the meeting that half term then you can place your ideas in the suggestion box in the main reception area. The agenda and minutes form each meeting will be on the website the following week, under the Parent Forum section.